Ubuntu, the MATE desktop and love. This is it. Embroidered logo on a quality jacket with a YKK brass zipper. Premium, warm material (50% cotton). You can use it for a long time. 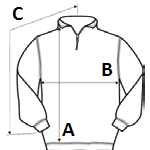 Measure one of your sweatshirts you have at home!